Since it is Halloween…it’s time for Frankenpants! George tears and wears his pants out at a frightening rate. I get snagged on the barbwire fence and slow down and try to unsnag. George just pulls hard enough to get away. Almost all of our jeans come from thrift store. It just isn’t worth the extra money to buy them new off the lot. 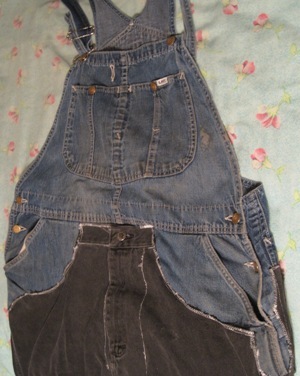 I also mend our farm pants. Style isn’t a big part of our farm life. Therefore…Frankenpants! The crotch was torn (speed trip through the barbwire?) and the knees were worn out in the bibs. Also George didn’t like the button fly. He mumbled something about them being too breezy. What to do? 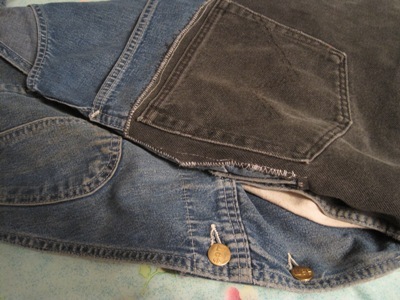 Sew the good parts off a pair of worn jeans onto the bib tops and ta-da: Frankenpants! To be honest, it would have been more efficient to go and buy another pair of thrift store bibs, however I took it on as an artistic challenge. And it is quite possible that my “free-time” is free and doesn’t have any value. (I don’t want to explore that idea too much.) George has tried on the Frankenpants and declared them a success. Time will tell. Anyone want me to alter their prom or wedding dress? Zig-zags and contrasting thread included! More on speed over style. Love those little cake pops? Can’t imagine making cute spheres out of food? Don’t want to count how many you would eat? 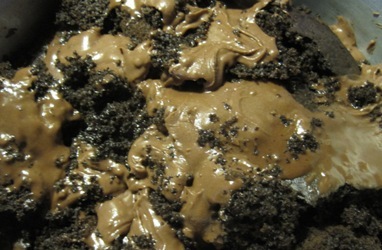 Make a chocolate cake and some yummy mocha frosting, dump together, close your eyes and enjoy! This entry was posted in Uncategorized and tagged George, recipes, sewing. oh but if you don’t’ make cute spheres – or lets be honest, blobby misshapen lumps that could in some alternate universe be cute spheres – you miss all the extra sugary crunch! I’m also much impressed with the Frankenpants and John is happy for George that he will no longer have a button fly… speed peeing is a problem with those… or so I hear…. To be honest, the sugary crunch is not a big part of the cake pop experience for me. And you are right, my mess is a set of neat cake pops in another universe! It will be interesting to see if George wears them! The pants were easier to put together than I expected, but I think this may be the only set of Frankenpants I make.